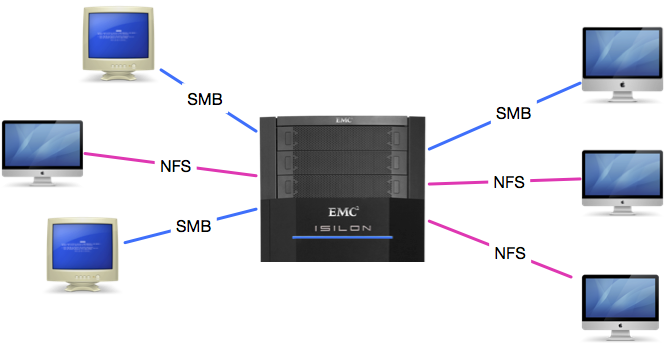 Last week a local customer reported strange problems with his EMC Isilon storage. For example sometimes when they copy a file from Mac A to their central storage they can’t see it on Mac B. Only Macs are affected by this strange behaviour – all their PCs work great. I was happy when they booked an on-site appointment to investigate the problems further. I started the investigation by talking to all the people there and writing down all the issues. After summarising I found out that most of the issues where caused by the fact that they mixed SMB and NFS. I discussed this with the customer and he happily agreed to switch all machines to SMB. If you create a file with umlauts in it over NFS3 (tested with MS Word) it can’t be opened over SMB (“Das Programm kann nicht gefunden werden”). It still works over NFS. You are unable to delete the EAs (._ Files) over SMB (“No such file or directory”). After removing the EA files over NFS, MS Word launched but complained about an illegal filename. I was furthermore unable to read the file (“no such file or directory”) using cat – however it was still working with NFS. Same problem as above! The file could not be accessed using NFS – everything working as expected over SMB. Furthermore SMB supports alternate data streams -> EAs get lost between protocols. It this case it is somewhat good that they are enabled as it would break QT7 otherwise. Everything works fine if there is no umlaut in the filename. In Terminal you can see them using ls. This is related to the EA ._ metadata files! If a file has EA’s they disappear if Finder is unable to access those. This is the reason why some movies with umlauts in their name are hidden. If you delete the ._ files they reappear – but are still inaccessible. 5.) Word sometimes unable to save files with Umlauts? Based on that knowledge I used the following procedure to locate the problem: I created a file with QT X (test.mov) on the storage. Then I duplicated it and renamed to either “NFS aaaÜ.mov” and “SMB aaaÜ.mov” over the corresponding protocol. Thereby two files were created. Thereby I found out, that there is a different filename reported if you are using SMB. I marked the corresponding changes with an *. What that means it, that there are character encodings issues. The expected behaviour is, that the file testfile.mov got renamed to testfileäöü.mov. While exactly that happened, the file got inaccessible. You cannot open it anymore. Switch all machines to SMB – Thereby pretty much all problems should be fixed automatically. Than we have to check if we can access all files containing umlauts. If not we have to rename them to work again (rename to some temporary name over NFS and rename back using SMB) This is the hard part, as we have to preserve the umlauts. Thereby we may be able to avoid the need to relink all assets. If you have the same problem and need help see the About Me page for contact details. I found similar issue If you have space at the end of file name such as: “bogner “, the file/folder will show up in Finder for 2s and then disappear immediately.